A terrific all-round performance by Jaipur Pink Panthers saw them thrash Dabang Delhi 36-25 in a Pro Kabaddi League match on Sunday. Nitin Rawal and Pawan Kumar combined to score 12 raid points whereas Manjeet Chhillar and Sidharth scored nine tackle points. 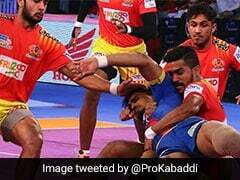 It was a disappointing performance by Dabang Delhi as they were second best for majority of the match. Abolfazl scored six raid points for Dabang Delhi. Jaipur Pink Panthers remain fifth in the Zone A table with 36 points from 11 matches. Dabang Delhi remain rooted bottom of the table with 28 points from 11 matches.